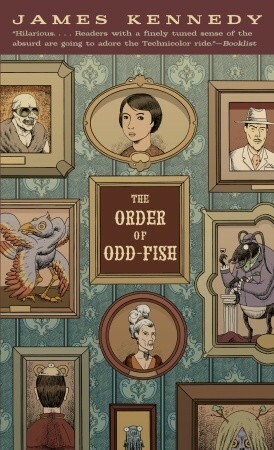 The Order of Odd-Fish by James Kennedy, February 9, 2010 (originally published in 2008). 416 pages. Published by Laurel Leaf. Source: author. The desert was empty, as though a great drain had sucked the world underground. Funny thing, before I got the emailing asking if I would be interested in reviewing The Order of Odd-Fish I had been looking at it in the book store while killing time one day. James Kennedy's writing was amazing and I cannot believe that there are not more books by him out yet. His writing style and the way he delivered the story was spot on; it's what really made this book such a page-turner-if I hadn't been in a book tour rush I would have devoured this one in a day. I have not really come across too many writers that can make some slightly gross scenes seen amusing and hilarious, but that is just what he did. I kept finding myself laughing because Jo kept finding herself in some...interesting situations. The Order of Odd-Fish, now that was an odd assembly. As odd as they were I enjoyed them because they were just so out there and the things they did were oddly entertaining to read about-researcher of scents. At first, when the order was first introduced I was a little confused at to their role and whether or not they would be any help to Jo, but as the story progressed I came to enjoy their quirkiness. Jo, was such a fun character to read about. I cannot help but love the character hat has the hard past, which usually is not their fault, and has to keep quiet on who they are. What made her such a great character was that she tried to subtly get her friends to believe that maybe, just maybe the poor Larouche child was not to blame for what happened in Eldritch City. She was definitely a strong willed character, which made her interesting because while she did not want to make an enemy she refused to back down to the one she did make. What I enjoyed most about The Order of Odd-Fish would have to be the plot. I really found it interesting how Jo was this dangerous person whose whole life was en-shadowed by this dark prophecy surrounding her birth and what she could/would become if given the chance. Talk about a load to carry on one's shoulders especially at such a young age and when she did not know exactly what that would mean for her. That was just one of the best parts of the book because it was there the entire time and the story would touch on it, but not give you the full story at once. The way her dangerous past played out was very nicely done. Final Verdict: The Order of Odd-Fish was weird, gross, and one of the funnest books I've read in ages. The Order of Odd-Fish earns 4 out of 5 pineapples.